Around the world, traumatic injury is one of the most common traumatic events, accounting for 9% of global mortality. Because of its high incidence, injuries cause millions of people to experience (temporary or permanent) disabilities on a yearly basis, including mental health problems (see http://www.who.int/topics/injuries/en/). PTSD develops in 10-20% of injury patients. Therefore, prevention of PTSD has been mentioned by some as the holy grail of trauma research. Up to now, only interventions based on cognitive behavioral therapy (CBT) have proven effective in preventing chronic PTSD. Mostly, this concerned early treatment (3-5 sessions) of acute (posttraumatic) stress symptoms. It is still unclear whether a single session of CBT-techniques could also prevent PTSD. Below are the recently published results of our brief self-guided Internet intervention, Trauma TIPS  (see Figure 1) . The aim of the program was to decrease acute distress, anxiety, and arousal, which are known to predict PTSD, and to prevent the onset of PTSD symptoms through various CBT-techniques. eHealth interventions are nowadays considered cost-effective and increasingly feasible, as global Internet use is growing exponentially. Although studies showed Internet-based CBT programs to be successful in the treatment of PTSD, little evidence exists whether these programs may prevent PTSD. Our study examined whether Trauma TIPS prevents the onset of PTSD, anxiety and depression in injury patients compared to care as usual. In addition, we evaluated whether Trauma TIPS led to a decrease in mental health care utilization during the first year after injury. Adult, level 1 trauma center patients were randomly assigned to receive the fully automated Trauma TIPS Internet intervention (n=151) or to receive no early intervention (n=149). Trauma TIPS consisted of psychoeducation, in vivo exposure, and stress management techniques (for more information on the intervention, see ). Both groups were free to use care as usual. PTSD symptom severity was assessed at 1, 3, 6, and 12 months post injury with a clinical interview (Clinician-Administered PTSD Scale) by blinded trained interviewers and self-report instrument (Impact of Event Scale-Revised). Secondary outcomes were acute anxiety and arousal (assessed online), self-reported depressive and anxiety symptoms (Hospital Anxiety and Depression Scale), and mental health care utilization. Intervention usage was documented. Of the total intervention group, 42% (n=63) logged in once, 36% (n=54) logged in multiple times (mean=3.6, s.d.=3.5), but 22.5% (n=34, i.e., non-users) did not log in at all. On average, patients logged in 1.7 times (s.d.=2.5), for 20.8 minutes (s.d.=26.3). There were no differences in study dropout or outcome measures between nonusers and users of the intervention, or between patients with a single log-in versus multiple log-ins. The results of our mixed model analyses showed no significant main effects of the intervention on symptoms of PTSD, anxiety or depression during the first year following injury. Both groups recovered from their symptoms equally over time with no significant group differences. PTSD rates declined from 9.2% (n=21) at 1 month to 4.5% (n=6) at 12 months, also with no significant differences between patients with and without intervention. The groups showed no differences in mental health care usage. Using post hoc latent growth mixture model analysis (LGMM), we examined whether the intervention could be beneficial to a specific subgroup of patients. This revealed 2 latent subgroups of patients with high initial (baseline) PTSD symptoms versus low symptoms. The main difference was between the high symptom groups: high symptom patients in the intervention condition showed a significant decrease in PTSD symptoms over time (p<0.001), but high symptom patients in the control condition did not (p=0.32). We did not find any main effects of the intervention on symptoms of PTSD, depression or anxiety. An important finding is that participants were reluctant to use the intervention. In fact, one in five patients in the intervention group lacked any exposure to the intervention. Based on these results, there are currently no indications that offering a voluntary, information-based prevention program via the Internet to unselected injury victims is useful in preventing PTSD symptoms. It is important to target future comparable Internet-based early interventions at individuals with high initial symptoms, since Trauma TIPS did show effects in a latent subgroup of participants with high PTSD symptoms at baseline. Future research may focus on innovative strategies to increase intervention usage. Moreover, it is time to move from universal to selective prevention, targeting high-risk individuals who are more likely to benefit from the intervention. 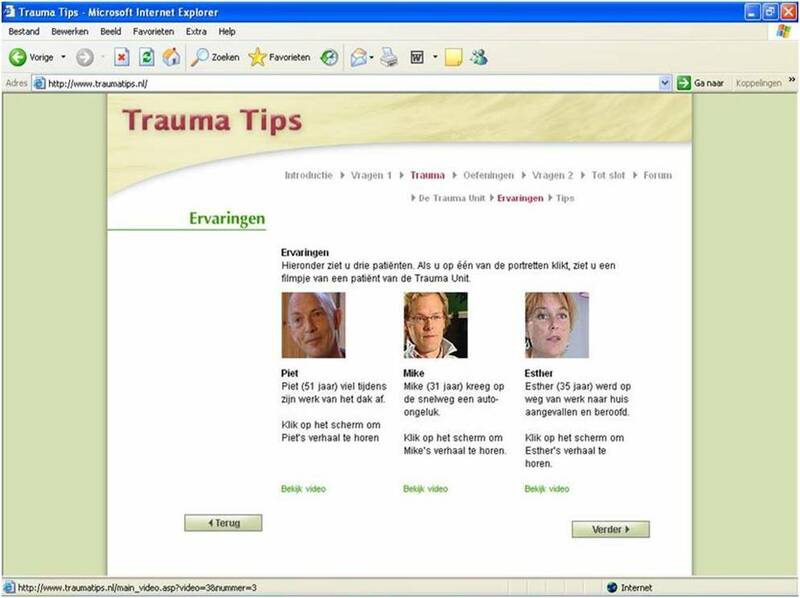 Mouthaan J, Sijbrandij M, Reitsma JB, Gersons BP, Olff M. Internet-based prevention of posttraumatic stress symptoms in injured trauma patients: design of a randomized controlled trial. European Journal of Psychotraumatology 2011 Nov 4;2(8294):DOI: 10.3402/ejpt.v2i0.8294. 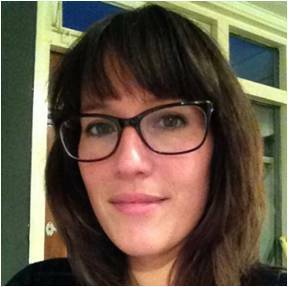 For more information, please contact Joanne at j.mouthaan@amc.nl or nl.linkedin.com/in/joannemouthaan/. This entry was posted in Tips & findings and tagged cognitive behavioral therapy, joanne mouthaan, online therapy, prevention, PTSD, traumatic injury by Eva Alisic. Bookmark the permalink.